Because we believe in the power of essential oils, and know of their incredible benefits, we want them to be used in as many households as possible. Plant Therapy was founded with two goals in mind: we want to provide the highest quality essential oils (and accessories) at a price that everyone can afford and we want to provide the highest quality customer service. Six years ago, Chris and Amanda Jones were given the opportunity to buy a small, all natural body care line company called Posergy. Posergy consisted of a full line of natural body care products and a line of natural makeup. They also sold a handful of essential oils to allow their customers to customize the body care products to their own likings. Soon after the company was purchased, Chris decided to do more research on essential oils. It was then he found that most essential oils being sold, were either overpriced or not of high quality. With the help of a certified aromatherapist and naturopathic doctor, Chris dove deep into the world of essential oils. Three years later and after much research, Plant Therapy was founded. Plant Therapy provides oils that are 100% pure, undiluted and of the highest quality. We source each oil from top suppliers around the world, buy in large volume, and negotiate the best prices possible. We then pass those savings on to you, the consumer! We also provide 100% customer satisfaction. If for any reason you are unsatisfied with your purchase, we will refund your money or simply replace the product/s. We want to have a relationship with our customers where they can trust us. We want them to feel comfortable trying new products, asking questions and becoming educated in the many uses and powers of essential oils. Part of this relationship comes from the desire that Plant Therapy has to educate our customers on not only the best ways to use essential oils but also the safest ways to use them. And with two certified aromatherapists on stafff, we feel like we can do this! When our customers pick up an essential oil, we want them to feel confident in it. We want them to know that they will have success because they know everything they need to about that certain essential oil and what it is best used for. We strive very hard to educate our customers. On our website, under each individual oil, you will find everything you need to know about that oil: the botanical name, chemotype (if applicable), origin of plant, extraction method, suggested uses, safety concerns and much, much more. Plant Part: Leaves and flowering tops. Aromatic Scent: Clary Sage essential oil has an earthy, fruity and floral aroma that is both nutty and herbaceous. Blends well with: Bergamot, Cedarwood, Chamomile German, Chamomile Roman, Geranium, Jasmine, Lavender, Neroli, Orange, Sandalwood and Ylang Ylang. 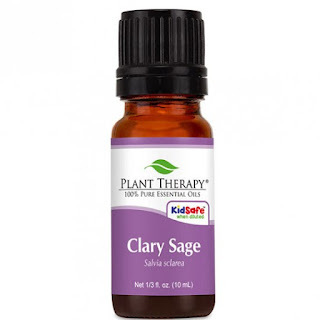 Suggested Uses: Clary Sage essential oil is the perfect hormone balancing oil to help ease symptoms caused by women’s issues. It can be used to treat PMS, hot flashes, depression, anxiety and insomnia. For menstrual pain, combine Clary Sage with Geranium, Marjoram and Carrot Seed. Research suggests that for some people, Clary Sage essential oil is a more effective anti-stress oil than Lavender. Add to your favorite carrier oil and use as a daily moisturizer or diffuse into the air for its mood-enhancing properties. Plant Therapy 100% Pure Essential Oils Clary Sage Essential Oil has been amazing for me! I just had a baby a few months ago so my hormones have been a bit out of wack but let me tell you, this Clary Sage Essential Oil has been a life saver. I've noticed I have less mood swings than I've probably ever had and my anxiety has improved as well. I highly recommend Plant Therapy 100% Pure Essential Oils Clary Sage Essential Oil to anyone looking to help relieve stress. Immune Boom is the perfect choice to keep your child healthy. To help build your child’s immune system apply to your child’s spine and/or bottom of their feet when needed. Specifically formulated for children ages 2-10. This synergy contains 100% pure essential oils of Lemon, Palmarosa, Dill, Petitgrain, Copaiba and Frankincense carteri diluted in Fractionated Coconut Oil at 3%. Plant Therapy 100% Pure Essential Oils Immune Boom Pre-Diluted Roll-On has worked wonders in our house! For awhile it seemed like my kiddos were sick just about every week and they took forever to recover. They just recently came down with colds and I began using Immune Boom Pre-Diluted Roll-On right away and within a few days they were completely over their colds. It smells great and my children enjoy having this applied to their feet before bed. I also have to add that I began using this product when they first came down with symptoms and I was able to stay healthy and I credit that to the use of Immune Boom Pre-Diluted Roll-On because I always get sick when they do. Let your family enjoy the great outdoors without getting eaten by insects with Ban the Bugs. Not only are you not using chemicals on your children, you are also only using the safest essential oils for children. Be comforted knowing that your children will be safe from those pesky insects by using nature’s time-tested insect repellents. Add 40 drops of Ban the Bugs to 2 oz of Fractionated Coconut Oil. Shake well and spray directly on yours and your children’s skin. Ban the Bugs is also perfect for a DIY bug repellent candle or DIY bug repellent wipes. Specifically formulated for children ages 2-10. This synergy contains 100% pure, undiluted essential oils of Citronella, Grapefruit, Geranium Bourbon, Rosalina and Patchouli. 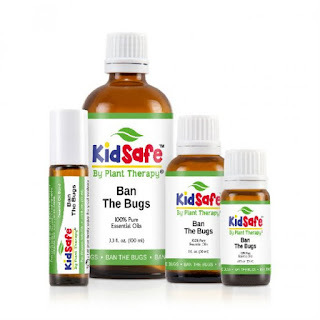 Plant Therapy 100% Pure Essential Oils Ban The Bugs is amazing! Right now you can't even step out the door without being swarmed with mosquitoes, or at least I can't. Mosquitoes love me so I've been looking for something to keep them off me for some time and I can honestly say I've found it! I diluted Ban The Bugs with coconut oil and sprayed on mine and my children's skin and now we can enjoy playing outdoors again. The mosquitoes stay away from us and we are itch free! I highly recommend this product for anyone who is looking for a safe and natural way to ban the bugs!